We instituted a “movie night” where we made a huge snack tray that was mostly vegetables (usually with one cheese and maybe one meat/fish choice). It was the only time the kids were allowed to eat in front of the TV.Usually, by the time the movie had become interesting, the vegetables were all gone. 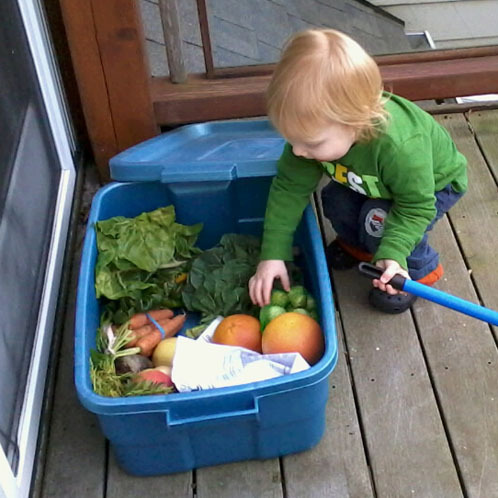 I use a tip my grandma gave me to get my kids to eat more fruits and veggies. She would say “Prep ’em and put ’em where kids will see ’em”. I wash, peel and/or cut up all my veggies when I bring them home. Then I put them in baggies and into the fridge right in the front. I also keep a bowl of Cuttie oranges, apples and grapes on a low shelf that my kids can easily access. Another way I add veggies is by roasting and then puréeing them and adding them to sauces. Believe me, the kids (and not so healthy hubby) will never know they’re there. One of my favorite sneak in is marinara sauce. Roasted carrot purée sweetens up the sauce beautifully. I tried going then CSA route (veggie subscription, so to speak). After three seasons, I gave up. Some of the veggies I loved, but I just couldn’t use that many turnips, beets, and kohlrabi. And the kale. Sweet mystery of life, the giant never ending bunches of kale. Couldn’t they mix it up and grow some collard greens, or mustard greens, or spinach instead? It was a burden every week trying to figure out what to do with it all. Too stressful! We’ll do u-pick instead–get the kids to go with you and have them pick fresh peas, green beans, blueberries, strawberries, and more. Get them to help cook, too. It makes them more likely to eat it! When they are at their hungriest (usually before a meal), let them first snack on a few thinly sliced veggies while you finish preparing the entrees. By the time everything (and everyone) makes it to the table, they’ve already eaten a full serving. Leaving the greens attached to the peeled carrots for little hands to grab onto also works…not sure why, but kiddos love it. hi Anne Marie. guess what? i’m raising my 20 month old great grandson!! he doesn’t like veggies much. here are some things i do. mix squash in his mashed potatoes. peas in mashed potatoes. avacado in mashed potatoes or yogurt. avacado with smashed bananas & yogurt. chop up fresh kale or spinach really small and put inside a grilled cheese sandwich. put fresh chopped spinach in his scrambled eggs. he will eat corn straight. tips for you! hugs. Joyous in Sequim. 1) Stir frys! Perfect way to cook them deliciously. Starting in the fall we go with alot of soups! Veggies are sooo easy to just pile in. With a loaf of rye bread it makes a great meal. In the summer we have a farm share as well, but have to pick it up instead of getting it delivered. Instead of juicing, I just throw everything in a smoothy (that way we keep the fiber and the kids like eating it with a spoon–like ice cream). As long as there is enough fruit (and maybe a touch of honey), I can put just about anything in there that the my kids (ages 5-15) would “never eat”. I add zucchini, kale (processed super tiny), carrots, raw egg (only from our own organic chickens), etc. When they ask me what’s in it, I just say: “oh, a little of this and a little of that.” Then I tell them after they eat it so they can know for mental sake what they’ve eaten. Also, in the summer and fall, I dehydrate batch after batch of kale chips! I keep them in half gallon jars. Then all year long, I can crumble them and put loads of them in just about everything I make from nut bars to salmon patties. No one even notices. I always try to incorporate veggies and fruit as much as possible. I find a way to mash the veggies in my blender and make low fat low sodium meatloaf or stuffed chicken. Another one for winter months is homemade oatmeal in the crockpot with apple’s and a touch of cinnamon. What a great idea to have them delivered to your door! We have resorted to just not having any other snacks in the house. My husband I will always choose the chips over an apple, but if there are no chips we resort to the apple. Gotta get rid of the junk food first! I always make a big batch of ‘Baby Veggies’ as they’re known in my family. Peel, deseed, cut – a whole pumpkin, 2 potatos, an onion, 3 Japanese sweet potatos, 4 carrots, 2 parsnips, a big bunch of swiss chard…boil all together, drain, mash with some butter…I throw it through the blender too. Season to taste…salt, pepper, a dab of vegemite. Traditionally in our family its always been our homemade baby veggies…but us adults always finished off more than baby!. Boiled carrots and parsnips mashed together are Yummy too. One of my favorite “go to”lunches is a salad of Fresh Mozzarella balls(the small ones)with tomatoes. I throw in Arugula,Cilantro,Basil whatever greens are in the refrigerator.It’s very versatile like all salads-you could add pine nuts, sunflower seeds,grated parm,olive oil and lemon juice,Balsamic Vinegar anything to it really.I eat it probably two times a week. I also love that it’s easy to throw together. I bought an Italian vegetarian cookbook which has really helped me learn how to cook vegetables. But even when I’m splurging on something like pizza, I always make sure to get veggie toppings. My favorites are spinach and mushrooms. For the little ones, Kraft makes a Mac and cheese veggie pasta. I juice tons of veggies in the morning and the kids always want a taste.